The Mane Objective: The Mane Objective 10K | 1M Giveaway Coming THIS WEEKEND!!!! The Mane Objective 10K | 1M Giveaway Coming THIS WEEKEND!!!! Back in December 2014, I hit two mega milestones. First, I hit ONE MILLION page views here on the blog. Two, I reached 10K followers on Instagram. The InstaRapture happened and snatched back like 300 followes, but you all showed me major love and I bounced back to the tune of 29 short of 10.6K. I feel like I don't say it enough, but I want it to be abundantly clear that I am so incredibly grateful to every single one of you. You all have been such a blessing to me -- with your kind words, positive affirmations, shout outs, likes, comments, and more. None of this would matter or be much of anything without all of you. How to Enter: Contest will be on maneobjective.com -- rules for entry coming soon. Be on the lookout for the specific TGIN giveaway post! 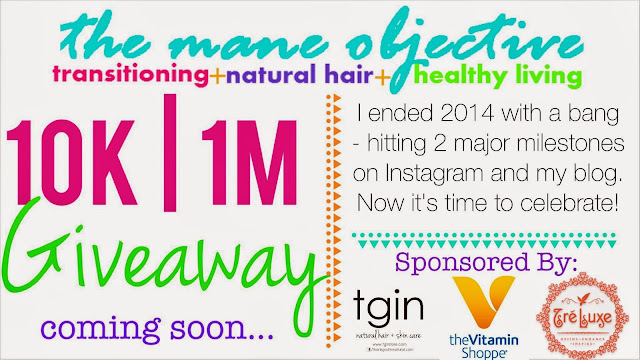 How to Enter: Keep your eyes peeled and be sure you're following me @maneobjective on IG! Each contest will begin at 12:00AM on the day of, and end at 11:59pm that day. You can enter all of the giveaways, or just the ones you're interested in. All winners will be announced Monday, January 19th 2015! Make sure you're checking the blog and keeping up with me on Instagram! Thank you all again, and I'm so excited about these giveaways!! !